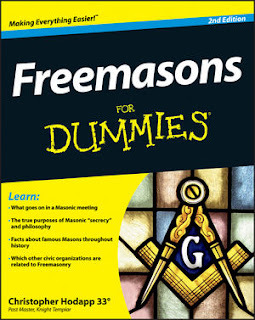 Freemasons For Dummies: Is Anti-Masonry A "Hate Crime?" The second story on all of tonight's local newscasts in Indianapolis, after the Academy Awards, has been a piece about the local Mosque and Islamic Center in neighboring Plainfield, Indiana having some graffiti spray painted on its exterior brick wall early Sunday morning. All of the TV stations are interviewing "shocked" citizens, area Muslims and political leaders, and have been loudly proclaiming that the FBI has been called in to investigate this as a "hate crime." Well, as callous as this may sound, welcome to the club, folks. Over the last several years, incidents around the world - and not just in the U.S. - have been increasingly reported of Masonic lodges being tagged with anti-Masonic slogans, Stars of David, All-Seeing Eyes, and other insulting markings. 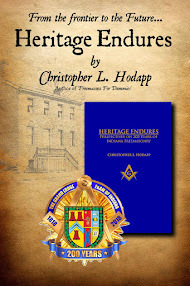 Worse, many lodges have been broken into, and priceless documents and items have been destroyed or stolen. One Australian lodge in 2013 was broken into four times in one year alone. In several cases, arson is not uncommon, causing untold damage. Just last month, an historic lodge in rural California was burned to the ground under suspicious circumstances. There have been many occasions of Masonic tombstones being spray painted, toppled, or broken. And in the most troubling story of all, a Muslim man was arrested in Wisconsin in January for planning a mass murder spree at a Scottish Rite center in Milwaukee. And yet, it was only this last case that managed to finally catch the attention of the FBI. Other acts of vandalism are rarely, if ever, treated as "hate crimes" against Freemasons anywhere in the world. That's because Masonry is not officially covered under existing federal or state hate crime laws. I think it's time that we as Masons start raising a little hell about this and taking our story public. While it's often true that the perpetrators of these crimes are frequently just teenagers who are bored, many others are older and more fanatical fundamentalists of one stripe or another who are acting out their hatred, fueled by demented websites and publications. We live in a more dangerous world now than ever before, and in some countries, Masons are actually endangered if they are publicly identified by name or in photographs. At the local level, every lodge today should have an alarm system that automatically notifies authorities in case of a break-in, and security cameras are also a good idea to help provide police with physical descriptions of vandals and thieves. During meetings, exterior doors should be locked, or monitored via a camera by the Tyler. And it's probably not a bad idea to request local police to drive through lodge parking lots occasionally, and during meetings especially. Unfortunately, we have to start taking notice of these things and actively reporting threats and actions against our members and lodges. It's becoming a much bigger problem than just simply being offended. And it's growing. Certainly we would agree, remembering the Masons who were killed in concentration camps during World War II. It is also time for the lodges that do not admit African Americans or have ousted gays, to accept American diversity and tolerance, and stop their hateful discrimination which is an embarrassment to all of us. And for a resolution of discrimination against Jews by the Scottish Rite in England and other jurisdictions, and against Jews in craft lodge in jurisdictions such as Sweden and Norway. In other words, let us not denounce bigotry while practicing it. No, we're not an oppressed minority. I find the idea absurd. And I think you should let Masonic building associations worry about their own security arrangements and let hem decide when to lock their doors. Just trying to raise awareness outside your little world, David. Feel free to ignore.